Looking like a pink fireworks explosion, Brazilian Plume sends up a sizzling display. Keep this South American beauty warm and give it plenty of sunlight to bring on the blooms. Late bloomer. 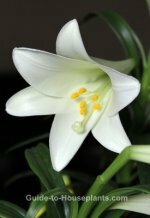 You can expect flowers later in the season than most houseplants, with most blooming in late summer and fall. Those vibrant rosy plumes are a welcome sight just when your outdoor flower garden is slowing down for the year. Pinch and prune. This robust shrub grows fast. Pinch off the growing tips to keep it from getting too big. Don't toss out those stem tips, either. Propagate them for more plants. Prune long branches to keep this shrub in shape. Cutting just above a leaf node (the place where a leaf is attached) will cause the stem to branch out where it was cut. You'll get a fuller, bushier plant by pruning. The best time to prune is early spring. Overwintering. 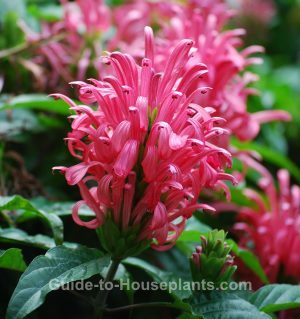 Move your potted Justicia carnea to a cooler location. It will tolerate temperatures down to 60°F/16°C in winter, when plant is resting. Reduce watering, keeping the potting medium barely moist. Stop fertilizing till spring. Something bugging your plant? Spider mites may attack new growth. Look for mottled, pale leaves with webbing between them. If your plant is infested, treat it right away and keep it away from your other houseplants because the tiny critters tend to move on to the rest of your indoor garden. Raising the humidity will help discourage spider mites that like dry air. Brazilian Plume loves to be misted. To repot...or not? Repot in spring, only when you see roots growing through the drainage holes. Use a heavy pot to prevent toppling; this shrub can get top-heavy after a couple years. Height: Up to 4 ft (1.2m) in a container. You can keep this shrub small by regular pinching and pruning. Light: Needs bright light and some direct sunlight to bloom. Water: Keep the soil evenly moist spring through fall. Water less in winter, while growth slows down. Water thoroughly, allowing water to escape through the drainage holes in the bottom of the pot. Remember to always use tepid water when watering your houseplants. Cold water shocks your tender tropicals. Humidity: Aim for 40% relative humidity or higher. If humidity drops in winter, use a cool-mist room humidifier to increase the moisture around it. Temperature: Average room temperatures (65-75°F/18-24°C). It will tolerate a minimum of 60°F/16°C in winter. Fertilizer: Use a high-phosphorous fertilizer once a month, spring through fall. Do not feed in winter. Propagation: Take 4-inch (10 cm) stem tip cuttings in spring and insert them in moist potting mix.